It was a super Sunday for Peterborough Northern Star in the PFA Under 15 Cup with both their teams winning by massive margins. 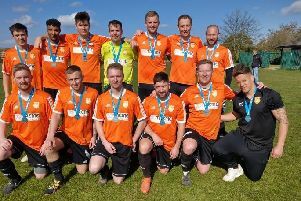 Northern Star Blue, the unbeaten leaders of Division One, came up against Division Three table-toppers Thorpe Wood Rangers Red and scorched to a 20-2 victory. James Pam and Oluwasegun Okunrinboye led the way with five goals each while Ahmad Babakarkhil fired four and Frederico Rocha hit a hat-trick. Pam, who played for Gunthorpe Under 14s last season, has now scored 23 goals this season and Okunrinboye 17. Northern Star Red also found goals easy to come by. They beat Riverside 8-0 with Samuel Wilson getting three of the goals. Kings Cliffe were also big winners. They beat Hampton Royal 11-0 with Benjamin Lovejoy and Jamie Wade both grabbing four goals. The biggest shock of the round saw Division Two boys Malborne dump out Division One team Hampton Blue 4-2. Jordan Giddings (2), Seeraj Gohil and Matthew Robson got their goals.